We could see another sedan by the end of the year. The Cadillac ATS and CTS were built with a daunting task - beat the BMW 3 Series and 5 Series. Although the Alpha platform underpinning both cars was probably the best in the industry, a few flaws kept them from selling and Cadillac decided to end production. The news isn't all bad though because Cadillac has now introduced a new sedan called the CT5, which will replace the gap left by the ATS and CTS. Even though crossovers are the new hotness, Cadillac hasn't given up on sedans. According to Automotive News, the CT5 will be joined later this year by a smaller sedan called the CT4. Cadillac President Steve Carlisle confirmed that the CT5 will make its official debut next month at the 2019 New York Auto Show following its online reveal earlier this week. The CT4 will arrive later in 2019, though Carlisle didn't confirm an exact date. Along with the existing CT6 sedan, the CT4 and CT5 will aim to replace the ATS, CTS, and XTS without acting as direct replacements. 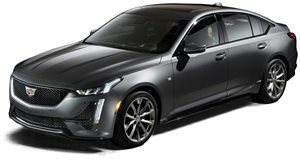 None of these new models will directly replace the mid-size CTS because the CT5 is compact, CT4 will likely be sub-compact, and the CT6 is larger than the CTS. When it arrives, the CT4 will be a competitor for entry-level cars like the Audi A3 and Mercedes A-Class. We still don't know what will power the CT4 but we can assume the 2.0-liter four-cylinder from the larger CT5 will be used. Cadillac is also rumored to be working on a CT4-V and CT5-V, which could use the company's new Blackwing V8. No matter what powers the CT4, "Boring sedans are dead," according to Andrew Smith, Cadillac executive director of global design. "I think awesome sedans are going to be around for a while," he added.